Welcome to the Viper Club of America! You should have received your 2019 Membership Packet. If you have NOT received your packet, please email me at Viper Club Member Services. Custom Lapel Pins and USB Flashdrives are now available for purchase, be sure to check them out in the Store. Hoping Spring will finally arrive so we can get more Vipers out on the roads!! 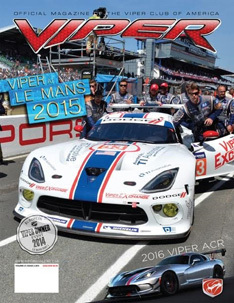 If you do not already receive VIPER magazine, be sure to subscribe today!